Our goal is to eliminate break/fix to the greatest extent possible. The vast majority of IT costs for the typical organization are related to emergency repairs and the labor, equipment and primarily, lost productiviyt costs associated with a system not functioning optimially. 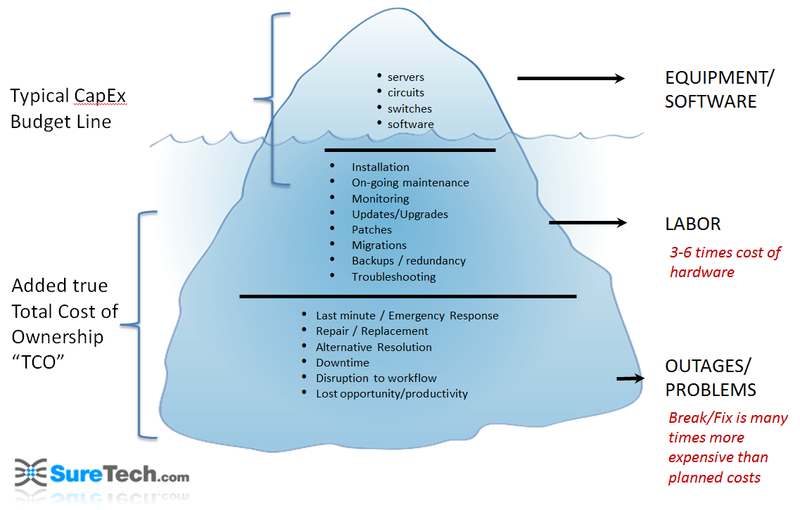 Proper maintenance to try to minimize repair costs is the next greates IT expense. The equipment that most companies associate with IT costs is actually the smallest component of an overal IT cost. The first place to focus therefore is on the biggest cost - inefficiency or instability in your systems. The absolutely biggest cost factor, and source of instability, is simply in maintaining networks and equipment communications. These days a CPU or most individual computer components are pretty simple. They are designed to do the same thing over and over with extremely low failure rates. The source of 90% of failure points is in the connection between components or the configuration of components. 90% of these connections and configurations are standard infrastructure that not only has to be set up UNDERNEATH most business services, but they need CONSTANT MAINTENANCE and updates as different components are continually upgraded and as technology evolves. What your business actually uses, in other words, is the last 10% of the cost which is the applications and data with which your company interacts. So why would you figure out how to mine coal, store it, burn it, convert it to electricity, store the electricity, transfer the power and do this all without burning down your office, when all you want to do is plug in a lightbulb? YOU WOULDN'T. You just by the electricity and only pay for what you use. Computers have now reached the point where you can just buy computing power and storage and PAY FOR WHAT YOU USE, which is namely the service of the applications and data with which your company interacts. SureTech.com and other firms now allow you to outsource the generator, and just purchase the POWER.